I wonder if Kim Davis could have fathomed during last year's State of the Union that she would be attending the next one. Davis has curried the favor of Republican presidential candidates, such as Ted Cruz and Mike Huckabee, who were both in attendance at a rally held on the jailhouse lawn when she was locked up. But though many GOP politicians have made high-profile attempts to cozy up to her, Kim Davis' State of the Union invite from Republican Ohio Rep. Jim Jordan was a complete accident. 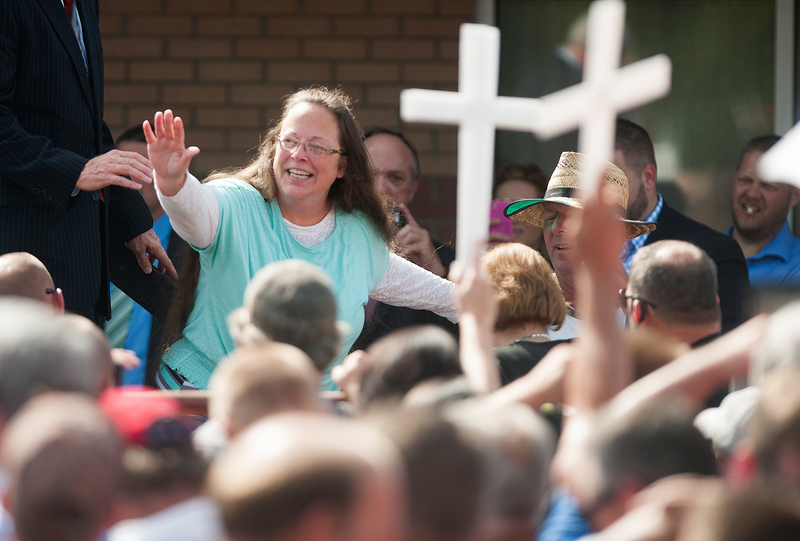 While the President will be extolling his “accomplishments” of the last seven years, Kim Davis and Mat Staver will be a visible reminder of the Administration’s attack on religious liberty and an encouragement for people of faith to stand. For seven years, people of faith have been in the crosshairs of the Obama Administration. The state of religious liberty is dire, but we cannot give up. That announcement sent the media into a frenzy. Who gave tickets to Davis? The Liberty Counsel wouldn't say, and probably with good reason. Although she was a popular figure for some evangelical politicians, her unwillingness to, you know, follow the law chased many others away — including (to an extent) Donald Trump, who is almost always willing to jump into the middle of any controversy. So who was still willing to roll the dice and put Davis on their guest list? Well, it turns out that the answer was a surprise to everyone — including the guy who invited her. Huffington Post reporter Matt Fuller managed to get Republican Rep. Jim Jordan to admit that his staff had given Davis some of his tickets without him knowing about it. "At the request of the Family Research Council, we gave the ticket to Kim Davis’ family,” Jordan said. “I found out today." So it seems that Jordan's staff made a rather political statement on his behalf. Maybe next time, they should let him know about it before the day of.